One of the most successful fund raisers I have ever seen is the Hawaii Potters’ Guild Empty Bowl Hawaii project held in 2009. Within two hours, the group had sold 700 bowls of soup, making it possible to donate $11,899 to the Hawaii Foodbank. The Empty Bowl project is a grassroots effort to fight hunger. It began in Michigan in the 1990s and spread to Hawaii two years ago. Here’s how it works: members of the Hawaii Potters’ Guild make ceramic bowls and ask local chefs to make soup to fill them. The bowls are sold for $20, soup and all. My husband, Jerry, and I bought two bowls in 2009 and we love them. We eat our oatmeal in them every morning and they remind us of those less fortunate. This year the Empty Bowl Project benefits Meals on Wheels, which delivers meals to the homebound and the River of Life Mission, which helps feed the hungry and homeless in Chinatown. 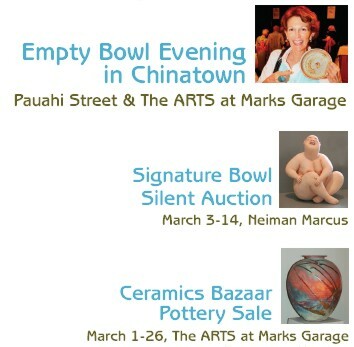 This year the Empty Bowl Project has expanded to include a silent auction and a month-long Ceramics Bazaar art sale. And, instead of 700 bowls, they will have 3,000 this year! On March 3, Neiman Marcus will kick off the Guild’s Signature Bowl Silent Auction. Twenty invited artists have designed special art pieces to be auctioned in the Ala Moana store from March 3 through 14. A month-long exhibition and Ceramics Bazaar art sale featuring work by participating artists and potters will be held from March 1 – 28 at the ARTS at Marks Garage. On March 18, which is designated Slow Art Friday throughout Chinatown, 20 of Hawaii’s top chefs will fill those 3,000 bowls with soup. The event will take place in ARTS at Marks Garage. This year the making of the bowls became a networking community project as the Hawaii Potters’ Guild reached out to schools, seniors and even keiki to help. Keiki from the after school program at Palama Settlement made bowls. Seniors in various craft programs made bowls. Boys and Girls Club members made bowls. Students from Kamehameha Schools and Punahou made bowls. The event’s fundraising goal is $60,000. Knowing the generosity of Honolulu’s people, even in these hard economic times, I’m betting they’ll exceed it. See you there! This entry was posted in Hawaii art, Helping Hawaii Non-Profits and tagged Empty Bowl Project, Hawaii Potter's Guild, Neiman Marcus Ala Moana. Bookmark the permalink.